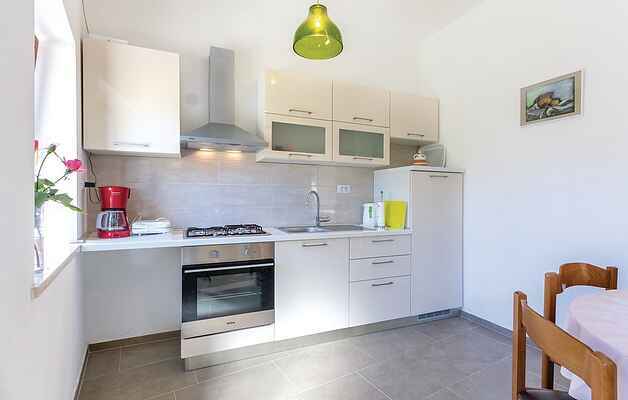 Spend your holiday in the small village of Rakalj, where this traditional Istrian semi-detached holiday home is located. It has been renovated in an authentic style and the nicely furnished interiors consist of two bedrooms, a bathroom and kitchen with living area. The pool will offer you the needed refreshment. Discover the beautiful beaches and small bays along the west coast of Istria. We recommend you to explore the interior of Istria and enjoy traditional Istrian specialties in one of the taverns. Visit the city of Pula, which will delight you with its rich historical heritage.